ขนาดลูกปัดหิน : ประมาณ 6x53 มม. Size of Bead : approx. size 6x53 mm. 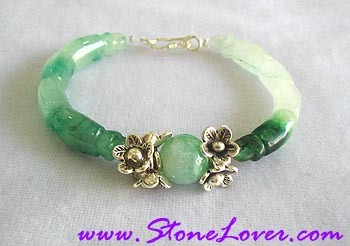 Healing Properties : The color of stone is green and green mixed with white. It’s been called the stone of the heavens, the musical stone, the stone of the loins and some people believe it can predict the future. Found in mountains and riverbeds it is considered to be “the essence of Heaven and Earth”. Chinese people believe that it is a holy stone with high appeasing power, strengthen the body & mental balance system and make a good decision. Pls. read with cautiously, this description is just from believes only.